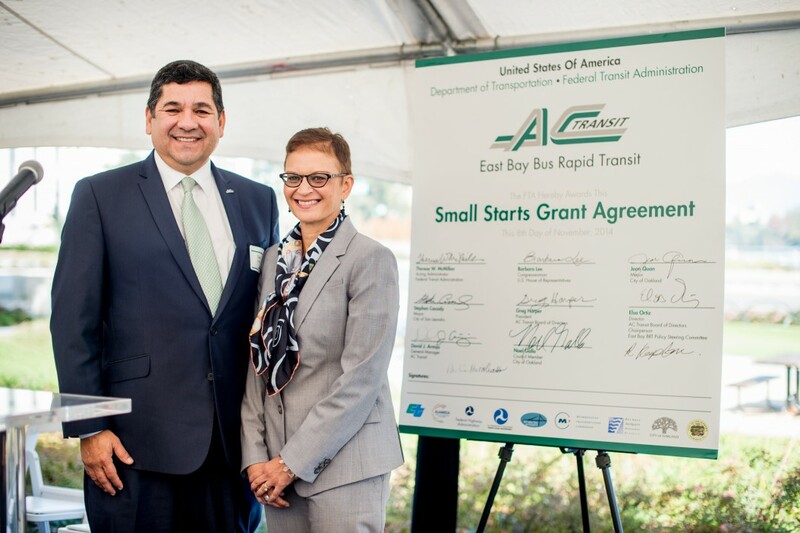 AC Transit has signed an agreement with the Federal Transit Administration (FTA) that commits the last of the funding needed to complete its East Bay Bus Rapid Transit (BRT) project, a nationally revered transit operation that will enhance bus reliability and reduce commute times along a corridor routinely knotted by traffic. In a ceremony with Acting FTA Administrator Therese McMillan, Congresswoman Barbara Lee, and a host of local dignitaries on November 8th, the agency received the final portion of a total of $81 million in federal grants, paving the way for the BRT construction. As one of the highest rated transit projects in the nation, AC Transit’s BRT will link one of the busiest traffic corridors in the Bay Area with a fast, economical, and environmentally friendly means of transportation. It will connect downtown Oakland to downtown San Leandro with dedicated lanes, transit signal priority, and artistically enhanced stations with level boarding. By reducing traffic levels and significantly cutting emissions and pollutants, BRT offers residents a viable alternative to driving on congested city streets. Additionally, BRT combines the express service and capacity of light rail with the convenience and affordability of riding a bus. The FTA’s Small Starts and New Starts programs are the federal government’s primary financial resources for supporting locally planned, implemented, and operated transit capital investments. From heavy to light rail, from commuter rail to bus rapid transit systems, these programs have helped to make possible hundreds of new or extended transit systems across the country. These rail and bus investments, in turn, have improved the mobility of millions of Americans, have helped to reduce congestion and improve air quality in the areas they serve, and have fostered the development of viable, safer, and more livable communities. The 9.5-mile BRT line will provide fast, frequent bus service between downtown Oakland and the San Leandro BART station, largely along International Boulevard. In addition to greatly enhancing transit service, the BRT line is expected to attract new transit-oriented development and help revitalize adjacent neighborhoods. The new BRT line will provide approximately 27,000 weekday trips when the line opens in 2017. The project will include 7.4 miles of dedicated bus lanes to speed service, as well as 34 new bus stations with real-time arrival information, level-boarding platforms, and ticket vending machines. The U.S. Department of Transportation is contributing approximately $81 million toward the $174 million total cost of the East Bay BRT project, including $50 million from FTA’s Capital Investment Grant Program, $25 million in FTA Bus and Bus Facilities funds, and $6 million in Congestion Mitigation and Air Quality Improvement Program funds. The remaining cost will be covered by state and local funding sources. 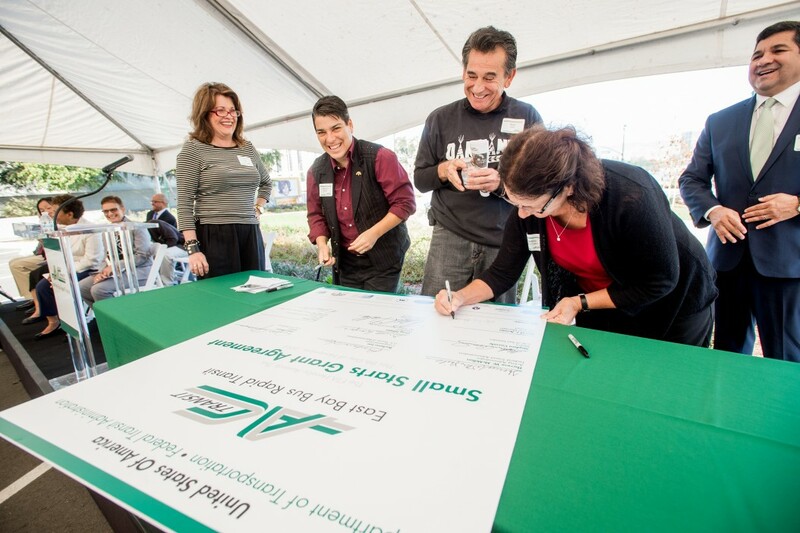 See more information on AC Transit’s East Bay BRT.